Sprouts: The Miracle Food - The Complete Guide to Sprouting. Say goodbye to pesticides and preservatives. In just one week, you can enjoy pounds of delicious young organic vegetables. Your salad bowl will come alive with tender buckwheat lettuce, hearty baby sunflower, crispy sweet pea greens, piquant radicchio, garlicky chives and much more. As baby plants, sprouts are bursting with concentrated nutrition--twice the protein of spinach, four times the protein of lettuce! And, as living plants, they provide the secret cell factors and phyto-chemicals that enrich our health and longevity in ways that can never be captured in a pill. Who is this Sproutman? 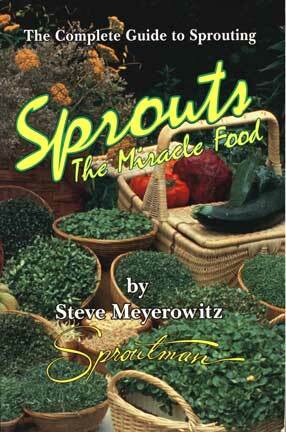 Steve Meyerowitz was nicknamed Sproutman in the 1970's because his apartment, 14 stories above the streets of New York City, was overflowing with gardens of mini-vegetables. After a lifetime of chronic asthma and allergies, Steve left traditional treatment and set out to search for his own cure. He found it in the miracle of sprouts. After years as an entertainer, he turned his apartment into The Sprout House, a "no-cooking" school in New York City. His inventions--the Sprout House Indoor Vegetable Kit and the Flax Sprout Bag--are sold nationwide.